So, you’ve decided to take the plunge and buy a dedicated smoker? Good decision! While you can smoke meat on a standard grill, it’s far more difficult to achieve the results you want and deserve. If you’re serious about smoking (and if you’re reading this, you must be), an offset smoker may be your preferred choice of cooker. Many guys and gals who love to grill have both a “standard” barbecue and a dedicated smoker. Now, if you’ve ever been through the process of selecting a grill before, you won’t be at all surprised to find out there are many different offset smokers available to choose from. In this article we aim to help by taking you through all the points you should consider when looking for the best offset smoker, and we narrow the field for you to just a few of the top options out there. We’ve done the research, and here we’ll present our findings. We look at what features you should find in the best offset smoker, as well as a few that are just unnecessary or can even hinder your cooking enjoyment. We’ve selected a small group of recommendations of what we believe are some of the best on the market, and we’ll be going over the pros and cons of each so you can shop with confidence, armed with your newfound knowledge. If you’re thinking about buying an offset smoker, then you probably already have a good idea what they are, and what you can do with one. In a nutshell, to avoid preaching to the choir, as it were, a smoker is a device designed to cook food indirectly at low temperatures in a smoky environment. Not only do smokers cook food, but they also impart flavor from the smoke generated by the cooking fire. An offset smoker typically looks like a regular charcoal grill but with 2 separate chambers, one for cooking in and a second small firebox attached to one side. The position of the firebox is what makes it a horizontal offset smoker. Charcoal and wood go in the firebox, where it is ignited. This is the sole source of heat used for cooking. The heat and smoke are channeled through an opening between the firebox and the main cooking chamber of the smoker, eventually exiting from a chimney or stack. A damper on the firebox and a vent on top of the chimney of the smoker allows you to control the temperature and amount of smoke inside the cooking chamber. Most offset smokers have a large cooking area, often comprised of 2 or 3 individual racks, which means you can smoke a lot of meat all at once. Want to smoke an entire pig? There’s an offset for that. Just be sure to choose one that’s a size that makes sense for your purposes. Over the course of many hours of smoking, it may become necessary to stoke the fire or add more fuel. With an offset, you can access the fire without lifting the lid on the cooking chamber. As a result, you’ll lose far less heat, and you won’t significantly prolong your smoking time. One of the real beauties of owning an offset smoker is that you won’t need to find room for both a smoker and a charcoal grill – many are combo smokers and grills where you can just light up your charcoal in the main cooking chamber and grill the way you’re accustomed to. Not that this is a practical reason to buy an offset, but they also look so cool in your backyard! Many of them look like something cowboys or pioneers might have cooked on. To my eyes, they look like little steam engines. There’s just something about the appearance of an offset that says serious smoking is going on here. There are some points to ponder before you dive in and pick up an offset. As with anything, there are cons to go with the pros, and they ought to be on your mind, too. Consider the weather conditions where you live and the degree of exposure in your primary grilling site. Bad weather, like high winds, heavy rain, and low temperatures all have a negative impact on smokers, and can hinder performance. If you have a tiny yard, or you’re an apartment-dweller, an offset may not be the smoker for you. Most of them have a large footprint – make sure you’ve got space before you plunk down your money. Running a smoker is not like lighting up a standard charcoal grill, and it’s certainly not like flipping a switch on a gas barbecue! The fire needs constant attention and care to ensure it’s continuously burning at the right size for hours. There’s a learning curve with smokers, and if you don’t put the time into honing your skills, you may grow frustrated with your purchase. If you’ve thought things over and decided that yes, this is the style of smoker for you, here are some general features to look for before settling on a particular make and model. If you’ve any grasp of physics, you’ll probably quickly realize that the biggest drawback of an offset smoker is the very thing that makes it what it is – the offset firebox. If all the heat is generated at one side, won’t the far side of the grill be significantly cooler than the closer side? A smoker made with lightweight metals will probably bleed heat all along its length, leaving you with a hot zone at one end and a cool zone at the other. You could compensate by moving the meat around, but that’s something you’ll want to minimize at least, if not eliminate entirely. Look for a heavy-duty smoker to minimize heat loss and keep the temperature as consistent as possible from end to end. What’s heavy-duty? Think ¼-inch steel. Having said that, it’s not easy to find this level of quality in a non-budget destroying model. The way to control the temperature on an offset smoker is by controlling the flow of oxygen. Oxygen is a necessary element for fire, and the more oxygen present, the more burn there will be. If vents are too small or too hard to adjust, you won’t be able to manage your temperature, and holding a consistent temperature is the key to good smoking. Internal venting is also important, so check to see where the connection between the firebox and the main chamber is. If the two meet at the grill height or higher, you won’t get good heat distribution. Heat likes to rise, so it’s no good to have the heat starting at the same height as the meat. Look for a lower connection for better heat dispersion. Or better yet, seek out a reverse flow technology smoker where the heat and smoke goes twice the length of the cooking chamber, enveloping all the food before it can get to the exhaust stack. A fancy paint job isn’t necessary for good smoked meat, but it does have to be a quality job done with high heat paint. If the paint can’t stand the heat, or if it’s so thin it chips off, you’ll soon find yourself with exposed metal that due to the elements soon begets rust. Not only is rust ugly (and your smoker should be a point of pride! ), it also causes thinning of the metal, and that can lead to heat loss and reduced performance. As with all grills and barbecues, temperature is very important with a smoker. While you can (and should) use meat thermometers to help determine doneness, it is also extremely helpful to know what the temperature is inside your smoker throughout the process. It is especially handy to know when the grill has gotten up to the right initial temperature. A good quality, calibrated built-in temperature gauge is an absolutely non-negotiable element of an offset smoker. If it isn’t there, it isn’t here! A good quality smoker is going to be a weighty item. We’re talking a team-lift item here! If you’re planning on moving your smoker around (and even if you’re not), you’ll appreciate having a good set of sturdy wheels for rolling your new baby around the patio. This applies to any grill – storage space will never go to waste! Good models will use some of the dead space between the legs for storage, usually with a solid shelf or grate for keeping larger items off the ground. Hooks for utensils are also great, but for me the most important thing is a side or front shelf. I insist on having a space to put plates, sauces and spices, and my beverage of choice! 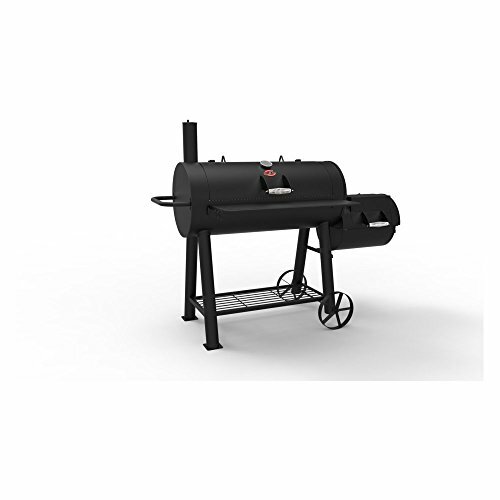 The market is full of low-cost offset smokers, and they are easy to find online and in stores. While a bargain basement price might seem appealing, be warned that these smokers might be enough to make you quit smoking altogether. They are cheaply made and make smoking very difficult. But, if you think you’d enjoy the challenge of smoking tasty meat with bad seals, inadequate ventilation, cheap hinges, flimsy wheels, and limited temperature control, then have at it! Now, if you are somewhat handy, it is possible to turn a cheap smoker into a decent smoker with a little customization. Many people enjoy fidgeting with baffles and applying high-heat silicone to try and upgrade a low-cost unit. The Internet is full of success stories and how-to videos, so if you want to channel your inner MacGyver, here’s your chance. Be sure to share your results with us! We believe it’s possible to purchase a good-quality smoker without draining your bank account, maxing out your credit card, or spending a weekend customizing instead of cooking. With that in mind, may we present our selections for your consideration in our roundup of offset smoker reviews. These aren’t the only good smokers on the market, but they’re ones we believe offer excellent value, and cover a range of budgets and needs. Oklahoma Joe is actually a real guy named Joe from Oklahoma, which is cool. He started the company back in 1987, using his knowledge as a competition-level pitmaster to help shape a quality smoker. OJ’s offer 6 different models of smoker, but we’ve decided to single out the Highland Reverse Flow. This smoker overcomes one of the fundamental problems with offsets by using ‘reverse flow technology’, forcing the smoke to flow over the meat and back again before exiting through the chimney. This helps provide even smoking and heating. You do also have the option of locating the chimney in the standard position, if you prefer. Dampers in the chimney help regulate airflow and adjust the temperature. Baffles under the grate help direct heat and smoke under the meat and then over the top, again for more even cooking. The whole unit is made of steel, including the wheels. It weighs nearly 200 pounds, so you’ll be glad for the heavy-duty rollers, and you know it isn’t going to lose much heat. There’s 619 cubic inches of cooking space on the grill, which isn’t huge, but it should be plenty for most folks. There’s a thermometer at the side closest to the firebox, so you’ll always know the temperature at the hottest spot. At the opposite end, you’ll find a spot to insert a second thermometer, which is an excellent idea. There is a narrow mesh shelf in front of the lid suitable for resting utensils, and a larger one below the main barrel for setting down extra fuel. As a nifty bonus, there’s a flat spot on the lid of the firebox where you can heat up sides and sauces on a frying pan or in a pot. Also appearing in our list of the best charcoal smokers, this entry level offset is a great first step into the world of smoking with an offset style cooker. While some argue that Oklahoma Joe’s has lost its edge, we think there is great value in their smokers for anyone who wants to enter the world of smoking with confidence and style. 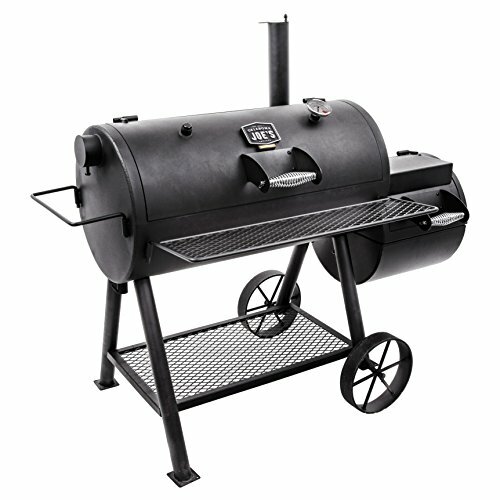 This is a great-looking, well-built smoker that should impress with its ease of use and durability. Have an up-close look at Amazon, and satisfy your need for specs by clicking on the link. I knew Dyna-Glo from their line of space heaters before I knew anything about their outdoor living products. A part of the GHP Group, Dyna-Glo produces patio heaters, grills, firepits, and smokers. Though the low-grade Photoshop work on the website gave me some concerns (watch your shadow directions, people! ), it appears they make pretty good smoker after all. There is plenty of space on this smoker, including 675 sq. in. in the main barrel, and 287 sq. in. in the firebox. You could even put a pot or pan on the squared off lid of the firebox. The wheels and legs seem adequately large and sturdy, but the front and lower shelves look smaller than average. A nice feature is the slide out ashtray drawer on the firebox for easy clean out. The box is a bit on the small side, so you won’t be tossing any logs on this fire. Stock up on flavored wood chips to enhance your smoke. The adjustable baffle on the firebox is rather small, and you’ll want oven mitts on before you make any adjustments. The grates are porcelain-enameled steel. I’d rather have seen cast iron used here, but with a bit of care, you should be ok. You can cook with charcoal in the main chamber right out of the box, so enjoy the versatility of two grills in one. Numerous owners have reported good results with the Dyna-Glo, though the thin metal and spot welds have resulted in some heat loss. Those shoppers who are wary of buying online will be happy to know that it is easy to find Dyna-Glo smokers at places like Home Depot. It’s a step up from the beginner’s array of smokers, and certainly much better than the smokers in the under $100 crowd. Once you’ve learned to control the heat, this smoker should provide plenty of enjoyment for the casual smoked meat afficianado. Ok, I’m pretty sure anyone who actually smokes competitively would find this unit doesn’t meet his or her needs. So ignore the words “competition pro” and focus on the smoker itself. If there were a level between low-grade and mid-grade, this would be it. Lower mid-grade? However you care to categorize it, the 8125 is a pretty decent grill. There is a lot of space under the lid, with a 719 square inch cooking area. The large 293 sq. in. firebox allows for a good, long-lasting fire, too. Adjustable dampers will help you make the most out of that heat; though I’m concerned the center-mounted thermometer won’t give a good enough temperature reading. If you already own a remote-sensing thermometer, though, this isn’t a deal-breaker. The bottom is “doubled-lined”, so you shouldn’t lose much heat here as the smoke moves from the firebox into the main chamber and begins to circulate. There’s an adequate front shelf, and a large bottom shelf for storage, and there are handy hooks for hanging utensils. The wheels are steel and should easily support the unit. Unlike on many other smokers, the wheels are under the firebox side. Why you’d put them anywhere else, I have no idea. The handle for the lid is a little close to the lid for my liking, but it is designed to stay cool. Nevertheless, I’d watch my knuckles on that if I were you. Anecdotal evidence from owners suggests there may be some heat leakage at the seals, but this may vary from unit to unit. But you do get a clean-out tool, so that’s a nice bonus. There are features on this low-cost unit that elevate it above the level of other similarly priced and cheaper smokers. You may need a little extra patience with this one, but it likely won’t just frustrate the heck out of you. This is a good choice if you’re not 100% you want to be a big-time smoker, and you’re trying to stick to a modest budget. Not our top recommendation, but not a bad deal, overall. Since 1983, the wonderfully named Pitts & Spitts has been making high-quality smokers in Houston, Texas. Their team of craftsman build superior gear from steel plate and high-grade stainless steel. They make everything from backyard smokers to portable kitchens you need a fifth-wheel to haul. For our purposes, we’ve gone with a “reasonable” alternative to needing a new vehicle just to smoke meat. If you’re already a barbecue pro (or highly skilled enthusiast), or if you’ve been smoking for a while and you’re ready to level up, this might be the offset smoker for you. It’s pricier than anything else on this list, but, viewed as an investment, it’ll pay off in the long run if you want to do a ton of smoking over the next couple of decades. The model number denotes the dimensions of the barrel, 18” x 30”. (There are two other models available – the U2436, and the U2448. I’m sure you can work out their measurements.) That’s a very large cooking chamber! There are 853 sq. in. of cooking space in this 350-pound mini-monster. Thankfully, it comes standard with a set of rubber tires by the firebox, and heavy-duty castors at the opposite end allow for total ease of movement. The wood/charcoal-burning firebox is quite generous, and it comes ready for an LPG tank for fast ignition. Dampers at the firebox and on the chimney allow for temperature control, and the ¼-inch thick firebox will hold the heat nicely. The chamber is a bit thinner at 3/16”, but should still keep the heat inside where it belongs. A nice feature we see on this unit is the chimney cap. Snow and rain will not get down inside your stack and cause corrosion where you can’t see it, and wind shouldn’t hamper your smoke circulation. I’m not fond of the little handle on a large lid, but then you shouldn’t be opening the lid often, anyway. There’s no lower shelf, thanks to the LPG tank bracket, but the upper shelf is fairly large. Just don’t expect to have your extra wood stowed handily at your feet. For some people, this unit is complete overkill, both regarding capacity and price. However, there really are FAR more expensive units out there. There’s a lot of bang for the buck in this big guy (ever wanted to smoke four briskets or 8 chickens at the same time?? ), and it’s well worth the investment if you intend to be a serious smoker. Brake the cost down and look at it from a per year perspective, and you might just see that this is worth the extra dollars if you want to get a taste of the big leagues of smoking. For specs and details, check out the U1830 on Wayfair. I don’t even know where to begin with this smoker, I really don’t. Yoder Smokers claims to make “competition grade BBQ products” and I have no reason to doubt them. I’ve looked though their product line-up, and some of their units look like the stuff of Steampunk dreams. If you need a smoker that weighs almost 1200 pounds, talk to these guys. Most of us do not need that, but that doesn’t mean we should have to settle for an inferior product. The Cheyenne is Yoder’s entry-level smoker, but it’s the real deal and worth your attention. It can’t help but grab your attention, actually, looking so much like a 19th century steam locomotive. It’s all black, from stem to stern, with a huge firebox, and oversize steel wheels. Even if it did nothing else but look awesome, it would be great to own. It does happen to smoke very nicely, too, though. The Cheyenne comes with 703 square inches. of cooking surface – you can even toss some burgers on the grate in the firebox. It weighs in at 315 pounds, so you’ll be glad for the oversized wheels making it easy to move, and the large handle. The thermometer is closer to the chimney end, so you’ll know what the temperature is at the end most likely to be cooler. Mind you, I expect the heat to be pretty close to even in this well-designed smoker. There are handy shelves in front of the main chamber lid, the firebox lid, and between the support legs, the latter being the ideal place for spare logs. The firebox has one large infinitely adjustable baffle to regulate air intake, and the heat from the box enters the main chamber well below the cooking surface, just as it should. A close inspection reveals very solid-looking welds, and all the grates and shelves are heavy steel mesh. If you want to do more than just look like a serious backyard smoker, think seriously about snagging this outstanding unit. Yes, it costs more than many similar looking smokers, but it will be so worth it when you start enjoying beautifully smoked meats with a minimum of fuss. Broil-King is a name you probably already know in the world of grilling. They are famous for their gas and portable grills, but they also make some good smokers. 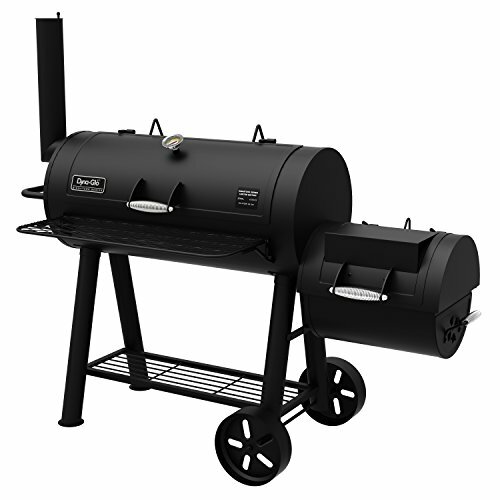 This is a good smoker for a practical person looking for a mid-range smoker backed by a familiar name – and a 5-year warranty! With 625 square inches of primary cooking surface, this isn’t a monster, but it will cook up a decent amount of meat. Hey, there’s nothing wrong with being suburban backyard-friendly! The steel is 2mm thick, which is slightly lower than optimal, but better than most of the cheap models. Total weight is 186 pounds, so it’s a pretty solid unit. The grates are porcelain-coated cast iron, so they should be good and durable. On the outside of the unit you’ll find an attractive chrome-coated cast aluminum handle at each end for opening the lower doors, and adjustable dampers for controlling the airflow. A single thermometer sits in the centre of the lid, so you’ll get the average temperature of the cooking chamber, but you won’t know what’s going on at the ends. Nice bonus features include removable ashtrays, a generous front shelf, a lower storage shelf, utensil hooks, and even a bottle opener. The lid has a large handle, and it swings wide open to allow full access to the interior of the main cooking chamber. The legs are thick, and angled nicely to provide stability when you’re moving your meat around. So, is it the best smoker out there? Not by a long shot. But there are FAR worse ways to spend your money! This smoker is a great option for anyone who wants a good smoker at a reasonable price for occasional use. If you want competition grade, you’re in the wrong place. If you make a choice based on your budget and your needs, you’ll do just fine with any of these smokers. But, if we had to pick just one unit to please the most people, it would have to be the Yoder Smokers Cheyenne. The price point is not totally in the stratosphere, the construction is excellent, the size is ideal for many applications, and it just looks so damn good! If you planned on spending more, you might want to reconsider. On the other hand, if it seems out of your reach, consider stretching the budget a little. You’ll be glad you did. Well, that’s it! Painless, right? Now you should have a pretty good idea of at least what to look for in a smoker, and maybe even a clear picture of which smoker is right for you. You’re probably so close to your first brisket or rack of ribs you can taste it! If you want to know more about the best offset smokers and how they work, be sure to read our article about that exact topic. You might also want to check out some of our articles about various meat cuts and how to cook them to get some inspiration for your new grill-baby. We love feedback, so please let us know what you thought about the article, and if you have your own ideas about what the best smoker is, we’re all ears! Until next time, we wish you tender meat, succulent sauces, and barbecues without rain. Thanks for a very informative article. But I was surprised to see the Dyna-Glo in this article. I’ve never seen their smokers, but I work in a store where we sell Dyna-Glo gas grills, along with several other other brands. Having assembled a few myself, I find it hard to imagine they make a quality product of any kind. The grills are cheap, lightweight, and flimsy. They are very difficult to assemble because the workmanship is so bad you have to be a magician to get holes, bolts, pieces and parts to line up properly. Mark, Great article. You say, “If you want to know more about offset smokers and how they work, be sure to read our article about that exact topic.” I can’t locate the article you are referring to. Can you post/email the link?